What could be better than a weekend getaway to relax and enjoy fun, creativity and laughs with friends? 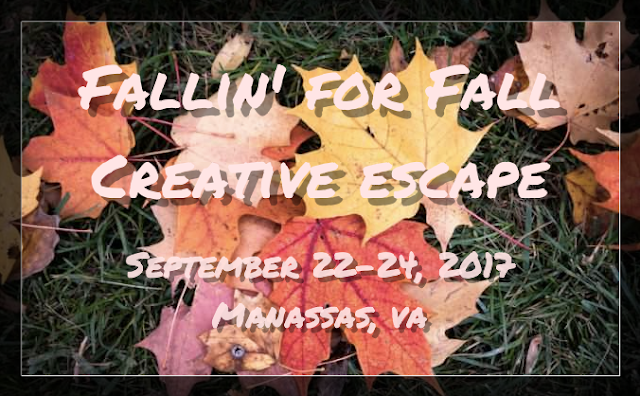 Join me for this "Creative Escape" and enjoy time to work on your own creative projects plus make and takes themed for fall and the upcoming holidays. Don't want to craft all weekend? That's okay too. Take time out to enjoy local Virginia wineries, shopping and more. The Creative Escape will start at 11 a.m. on Friday, September 22nd and will end at 2 p.m. on Sunday, September 24th. The crop room will be open from 11 a.m.-midnight on Friday, from 8 a.m. til midnight on Saturday and from 8 a.m. til 2 p.m. on Sunday. I will be basically be bringing my studio for you to use. You'll be able to check out stamps, framelits/thinlits, embossing folders, ink pads and more to use. There will be Big Shot stations on site so there's no need to bring yours if you don't want to.